Gov. Paul LePage speaks Wednesday, Dec. 5, 2012 at the swearing in ceremony for new representatives at the State House in Augusta. 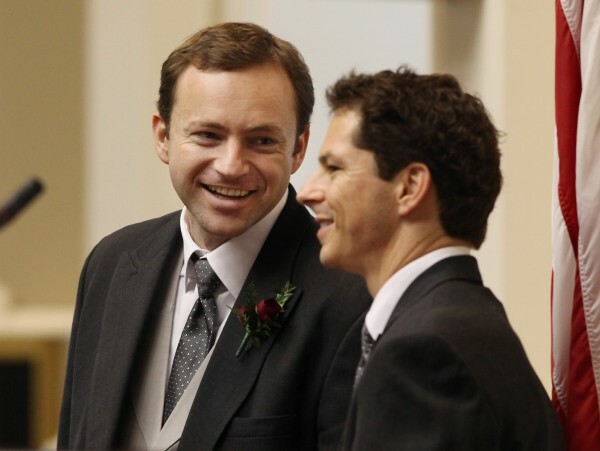 Newly elected Speaker of the House Mark Eves D-North Berwick (left) speaks with newly elected Senate President Justin Alfond, D-Portland, Wednesday, Dec. 5, 2012 during a joint convention to elect constitutional officers in Augusta. AUGUSTA, Maine — Hard feelings from a bruising election campaign followed by caustic rhetoric and an unfamiliar political landscape have combined to foul an atmosphere for cooperation in the Maine State House at a time when bipartisanship is most needed. With the unsteady economy eating away at revenues, newly elected lawmakers face hard budget choices that are bound to fuel debate. And Gov. 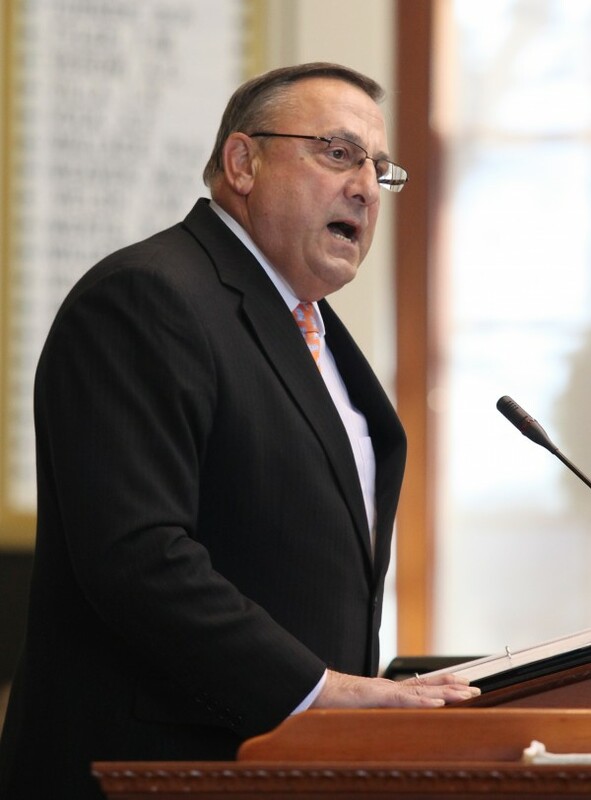 Paul LePage has promised to press forward with pet issues that have proven difficult in the past, including energy costs and education reforms. Unlike last session, when the Republican governor had a Republican majority, Democrats are in charge of the House and Senate for the next two years. So far, the two sides have not gotten along well, and they will need each other to get anything done. “I’ve been hanging out here since the ’70s, and I’ve never seen anything like it,” George Smith, a State House fixture and outdoors issues writer, said when asked if he has ever seen a session get off to such a poisonous start. “There’s plenty of Republicans who want to get off to a good start, but [LePage] is pushing them toward the Democrats. He’s weakening his own leadership,” said Smith, a Republican. Just over a month ago, harshly worded campaign ads, often bankrolled by outside political forces, toyed with facts in attempts to spear some candidates. Hard feelings carried over to last week’s session-opening crack of the gavel. Meanwhile, the governor refused to meet with Democrats out of frustration over being trailed by a Democratic video tracker, then shocked many lawmakers with his remarks at the session’s formal opening when he sarcastically thanked the Democrats for “my own paparazzi.” He toned down his remarks between Senate and House appearances, but they still didn’t go over well. Democrats, despite their feel-good rhetoric, have been quick to take potshots at LePage. When the figures were not yet final on a spending curtailment plan being prepared for the governor, the new Democratic leaders, House Speaker Mark Eves of North Berwick and Senate President Justin Alfond of Portland, expressed shock that LePage had not looped them in on his plan. Democrats had no intention of recalling their video tracker despite the governor’s displeasure, said Ben Grant, Maine Democratic Party chairman. “This thing with the tracker is petty,” said Grant. He also pointed out that some early-session antagonism can be expected, given the partisan divide between the legislative and executive branches. There’s still time for the two sides to ease the partisan stress, and leaders from both sides said on opening day they hope that happens. And Alfond extended an olive branch to LePage by inviting the governor and his wife to dinner at a restaurant of LePage’s choosing. “Even as we meet here today, there are those on both sides spoiling for a fight, and expecting the worst — a showdown in Augusta between the Blaine House and the Legislature,” Alfond told senators Wednesday. “I say let’s disappoint them. Senate Republican Leader Michael Thibodeau of Winterport reminded senators that the two parties had to cooperate in order to balance nearly all budget documents last session. “Balancing the state budget following the recent shortfalls promises to be one of the top priorities for the 126th Legislature. But I am confident that we can work with our Democratic colleagues to achieve real solutions for the people of Maine,” Thibodeau said. Statements reflecting similar sentiments came from House leaders. Correction: An earlier version of this story requires correction. Ben Grant is chairman of the Maine Democratic Party, not Republican Party.